Isabelle Fournet is a Film & Digital Creative Director. Currently Creative Director of Mosaic of Change (UNESCO partners), a universal storytelling platform presenting a visual language through immersive design experiences that spur intercultural dialogue and understanding to inspire peace, sustainability and foster change. As a multimedia artist, she writes, directs and edits documentary and fiction films, awarded 3D computer animator, she develops apps and explores new media for the communication and education like VR/AR/AI (virtual reality, augmented reality, artificial intelligence). Isabelle works on themes related to the environment and socio-economical development within the context of our shared humanity. It’s these passions, supported by a keen and critical eye, that define Isabelle as a visual storyteller. 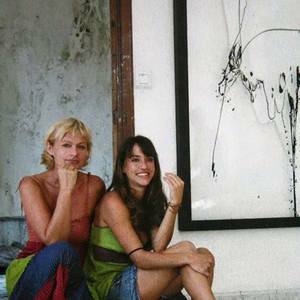 Isabelle works in English, French, Spanish, Swedish and Catalan. For her work she has various awards in computer animation, stop motion animation and 16mm film. As a multimedia installation artist, she has her work exposed in France, Switzerland, UK, Sweden, Norway, Spain, Italy, Baku, Azerbaijan, USA & Canada. Isabelle was born and raised in Spain and is fluent in five languages. She studied film at University Paul Valery (Montpellier, France) and received her Masters in Computer Animation and a Master in Documentary filmmaking in Spain. She is the mother of two children and currently lives in Los Angeles. Equilibrium Festival August 2017 Lake Tahoe "Land To Lake" Data visual art piece about the state of Lake Tahoe Basin. EarthX 2018, Texas IMPACT VR experience.